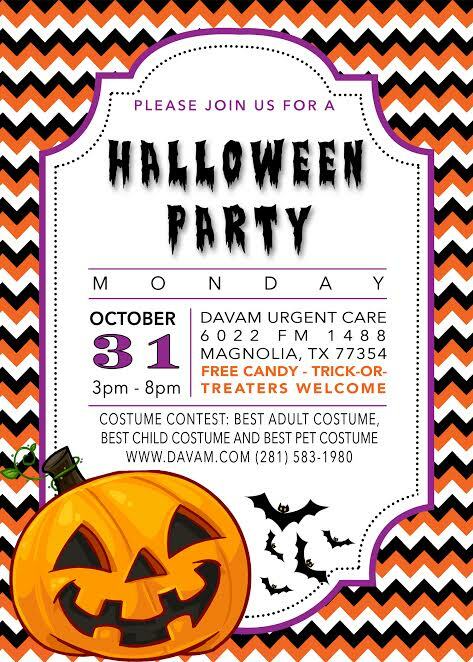 Davam Urgent Care in The Woodlands, TX is excited to announce our third annual Halloween event and costume contest. The Halloween event in the Woodlands, TX will take place at Davam Urgent Care from 3pm- 8pm. Trick-or-treaters are welcome and candy will be passed out. We are inviting the public to stop by, see our clinic, and enter our costume contest. Entries may be submitted by visiting us in person or by posting a picture on our Facebook page. All social media entries must be posted by 9pm on Monday, October 31st. Winners will be announced by 5pm on Friday, November 4th. Davam Urgent Care in The Woodlands will also be hosting a pumpkin carving contest for employees. The employees will paint pumpkins with the theme of their choosing. All of the entries will be displayed in the clinic for votes, and will also be on Facebook. The public is encouraged to view the different pumpkins and vote for their favorite. Our marketing staff will also be participating in the Carnival 31 Trunk or Treat event at Chick Fil’ A located off of 1488 in Magnolia, TX. The event will take place on Monday, October 31st from 6:30pm – 8:30pm. We will have a fun game set up and be passing out candy and prizes.